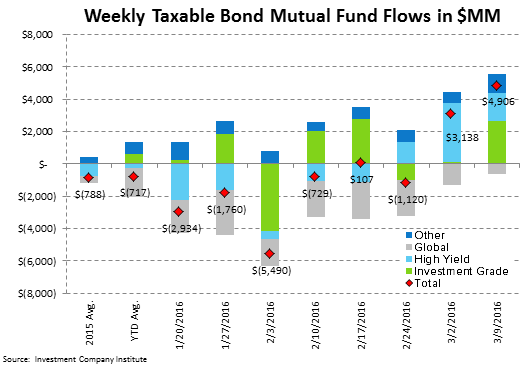 Takeaway: Re-risking continued in high yield this week with a +$1.6 billion subscription, the third straight week of rebound. Editor's Note: This is a complimentary research note originally published March 17, 2016 by our Financials team. 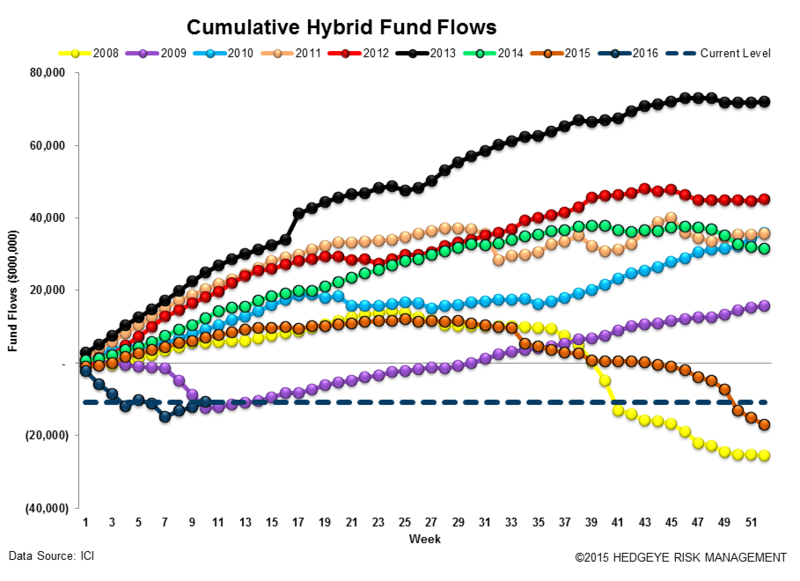 If you would like more info on how you can access our institutional research please email sales@hedgeye.com. 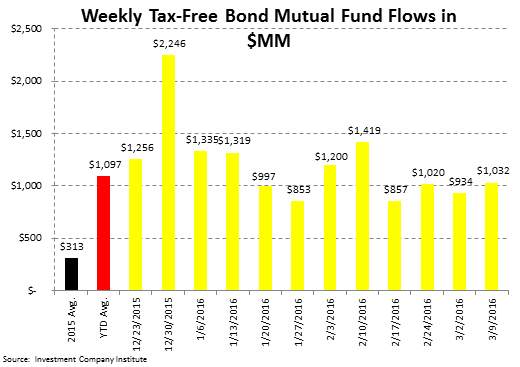 Re-risking continued in high yield this week with a +$1.6 billion subscription, the third straight week of rebound which has tallied +$6.6 billion. 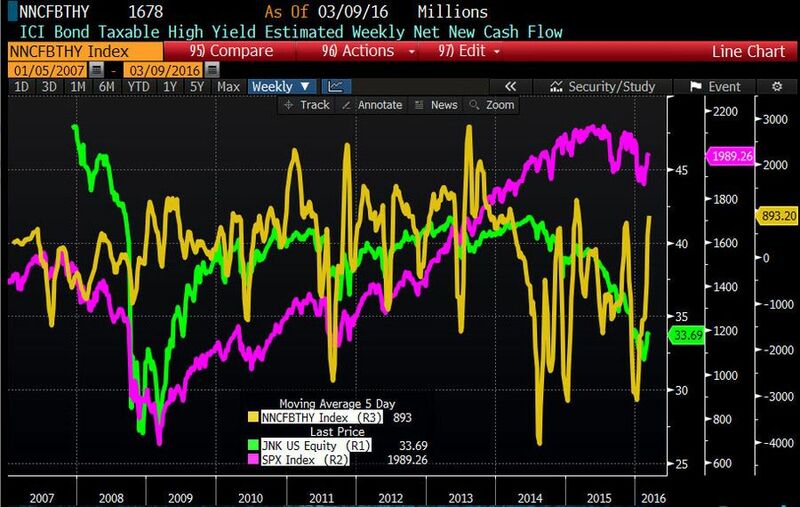 Either U.S. high yield is a great buy currently still sitting at depressed levels or U.S. equities should be put out for sale. Historically there is a close directional relationship between stocks and non-investment grade bonds and with the substantial divergence which has unfolded since 2013, something has to give. Below we plot, U.S. high yield fund flows (orange line) which are still in a downtrend within a 5 week moving average, the high yield ETF, the JNK (in green), and the S&P 500 in magenta. 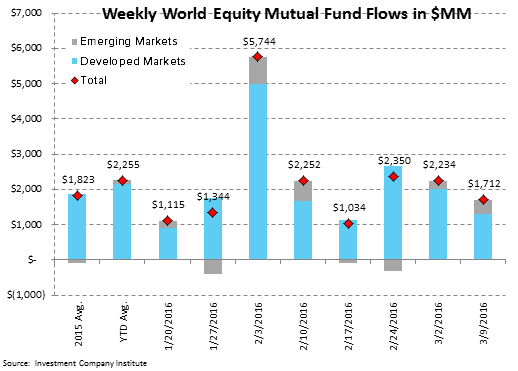 In the 5-day period ending March 9th, total equity ETFs and mutual funds experienced a +$5.1 billion inflow, the equity category's largest inflow so far in 2016. 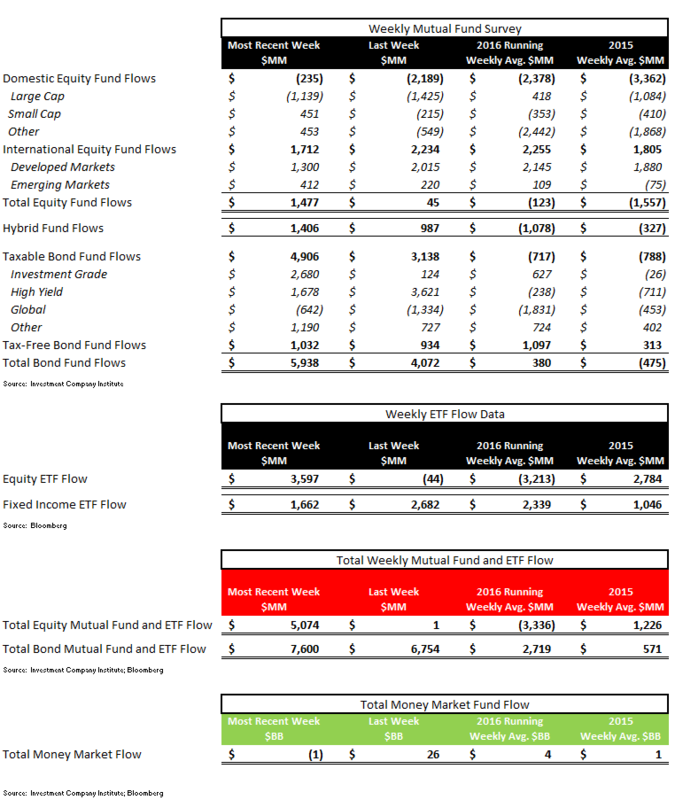 The total equity subscription was mostly comprised of +$3.6 billion to equity ETFs with investors depositing +$1.7 billion to international equity mutual funds. 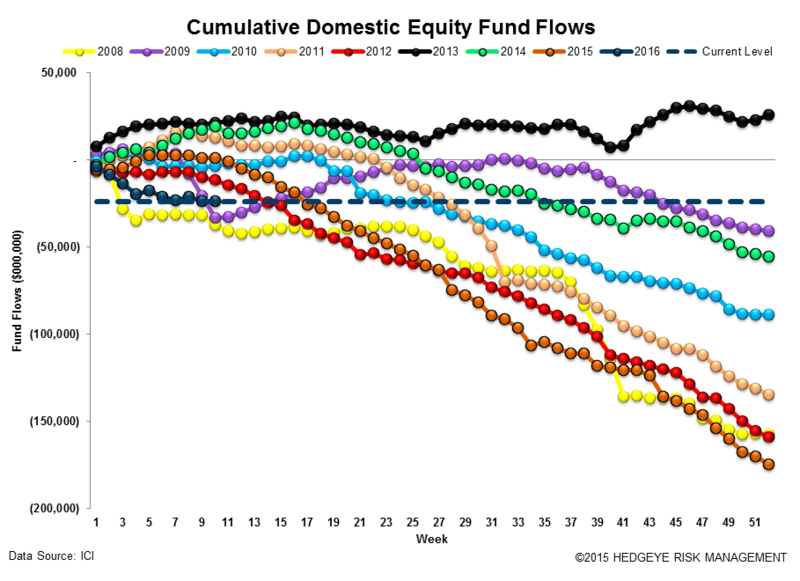 Domestic equity funds continue to bleed out however with -$235 million reigned in by investors. 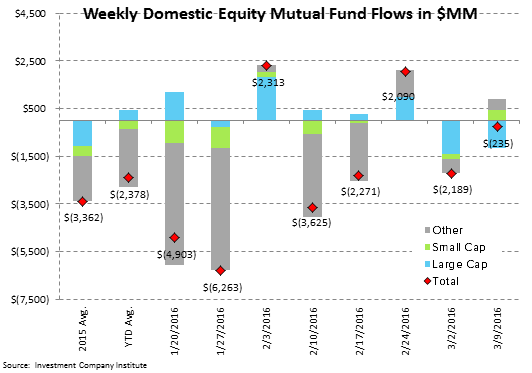 In the most recent 5-day period ending March 9th, total equity mutual funds put up net inflows of +$1.5 billion, outpacing the year-to-date weekly average outflow of -$123 million and the 2015 average outflow of -$1.6 billion. 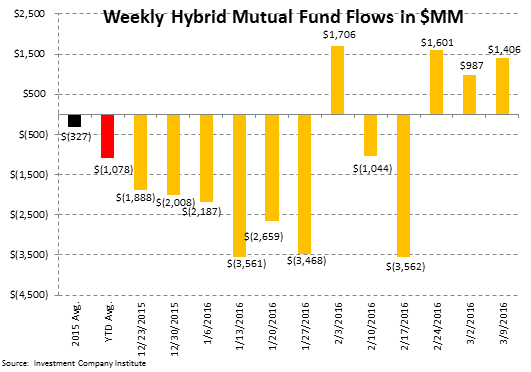 Fixed income mutual funds put up net inflows of +$5.9 billion, outpacing the year-to-date weekly average inflow of +$380 million and the 2015 average outflow of -$475 million. 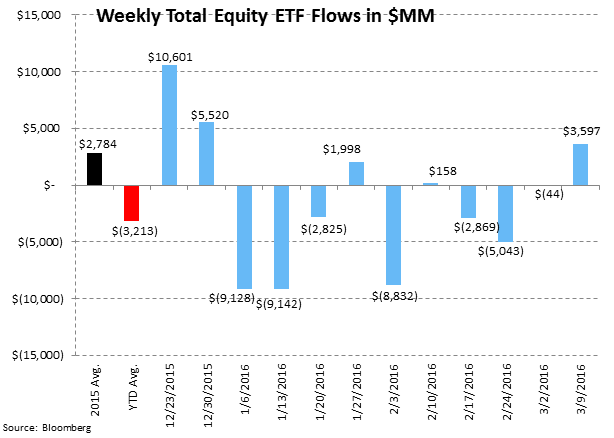 Equity ETFs had net subscriptions of +$3.6 billion, outpacing the year-to-date weekly average outflow of -$3.2 billion and the 2015 average inflow of +$2.8 billion. 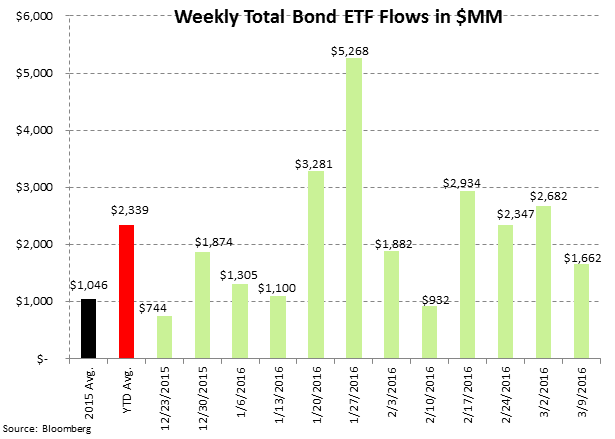 Fixed income ETFs had net inflows of +$1.7 billion, trailing the year-to-date weekly average inflow of +$2.3 billion but outpacing the 2015 average inflow of +$1.0 billion. 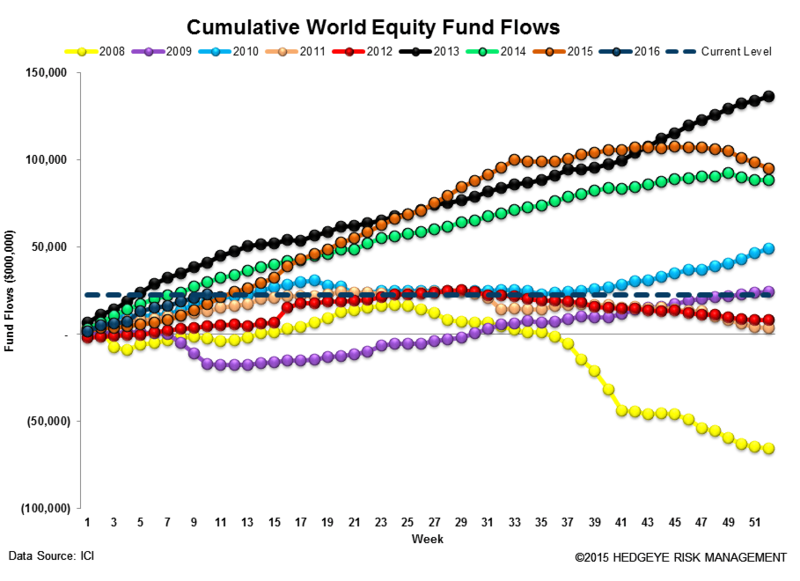 Mutual fund flow data is collected weekly from the Investment Company Institute (ICI) and represents a survey of 95% of the investment management industry's mutual fund assets. 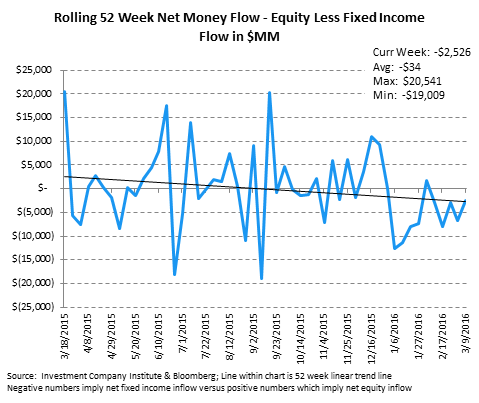 Mutual fund data largely reflects the actions of retail investors. 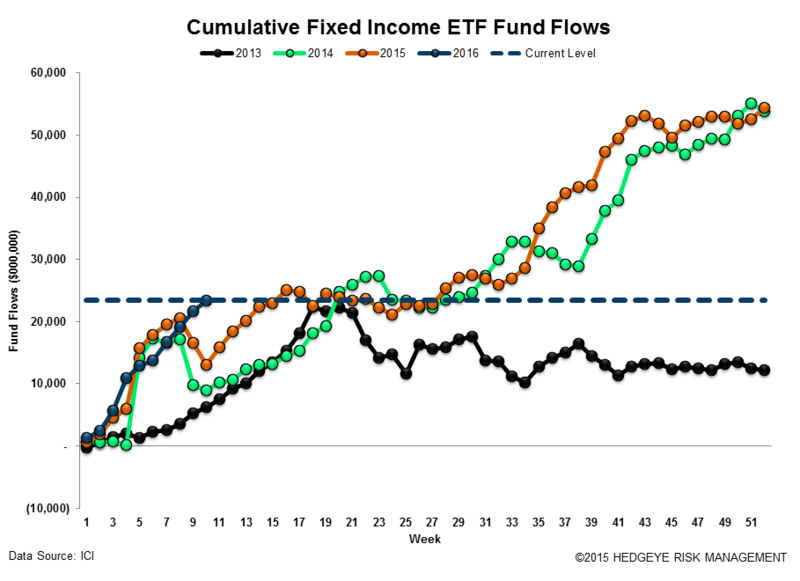 Exchange traded fund (ETF) information is extracted from Bloomberg and is matched to the same weekly reporting schedule as the ICI mutual fund data. 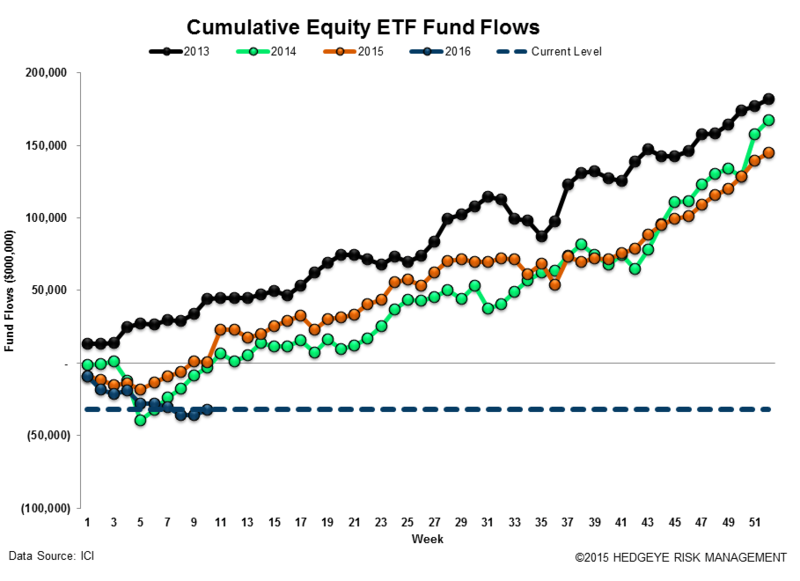 According to industry leader Blackrock (BLK), U.S. ETF participation is 60% institutional investors and 40% retail investors. 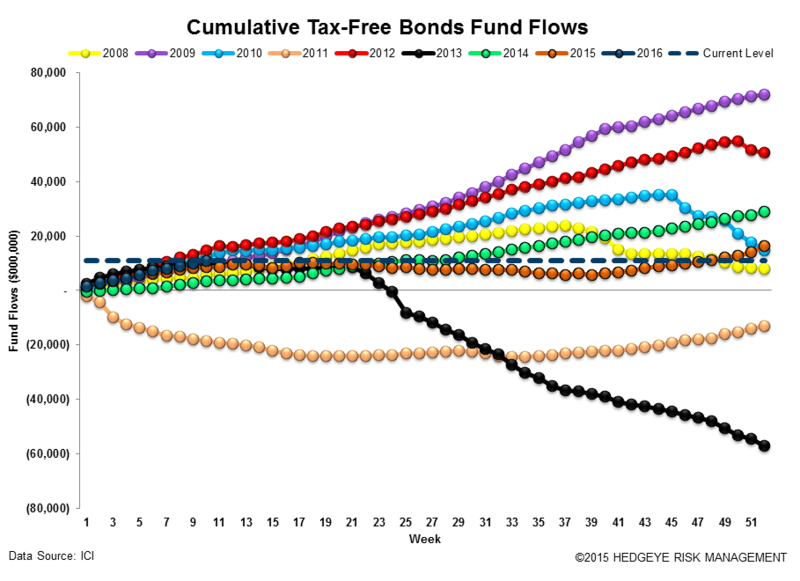 Cumulative Annual Flow in Millions by Mutual Fund Product: Chart data is the cumulative fund flow from the ICI mutual fund survey for each year starting with 2008. Sector and Asset Class Weekly ETF and Year-to-Date Results: In sector SPDR callouts, investors contributed +4% or +$396 million to the consumer staples XLP ETF. 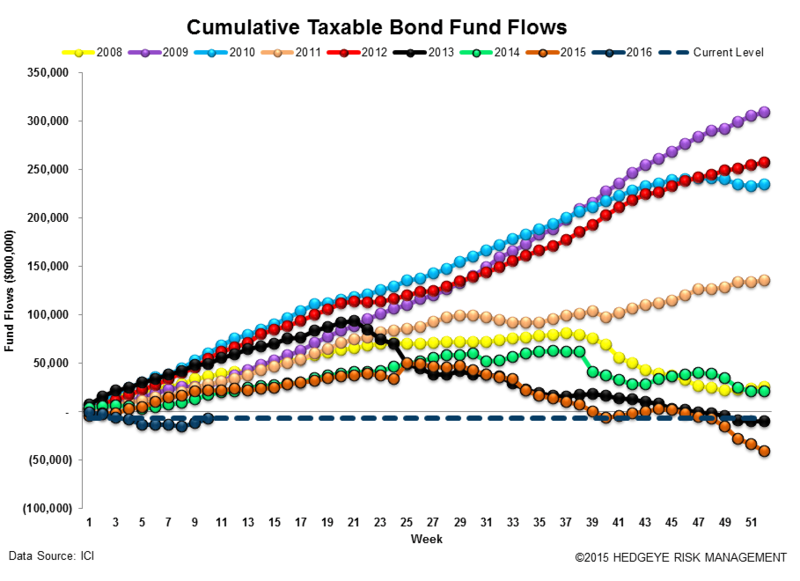 Cumulative Annual Flow in Millions within Equity and Fixed Income Exchange Traded Funds: Chart data is the cumulative fund flow from Bloomberg's ETF database for each year starting with 2013.